Have you ROARed yet today? 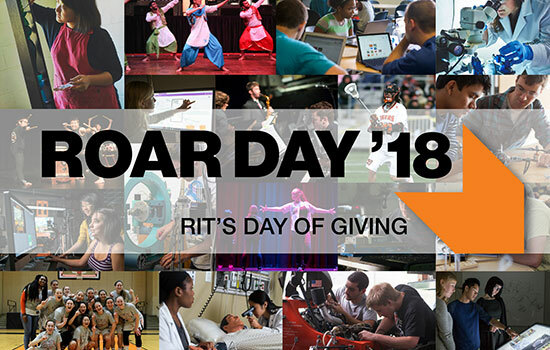 ROAR Day, RIT’s annual day of giving, is being celebrated from midnight to midnight on Oct. 2. During this time, members of the RIT community are encouraged to make contributions to their favorite area of the university. The philanthropic contributions given on ROAR Day will be included in Transforming RIT: The Campaign for Greatness. This blended campaign seeks support from a variety of investors, such as parents and alumni, government and corporate agencies and research foundations. Currently, the university has raised just over half of the $1 billion goal. Infinity Quad, 10 a.m.–5 p.m.
Wallace Library lobby, 10:30 a.m.–2 p.m.
Golisano Hall atrium, 10:30 a.m.–2 p.m.
Lowenthal Hall, 10:30 a.m.–2 p.m.
Gracie’s lobby, 10:30 a.m.–2 p.m. Gifts via credit card can be made on the ROAR Day website. “There are so many areas of RIT that are impacted by donor support on ROAR Day. From a very small student club to one of our biggest colleges, so much support is generated in just 24 hours,” said Fredyne Frey ’09 (communication and media technologies), director of The Fund for RIT. In addition to satellite sites across campus, there will be a large tent set up in the Infinity Quad with different activities available for students, faculty and staff. There will be games, opportunities to win RIT prizes, an ice cream bar and other fun activities to get people excited about giving. Last year, the gifts given on ROAR Day supported 333 areas of the university. The Student Government study abroad student support fund, varsity sports teams and the multidisciplinary senior design program are just a few examples of the impact ROAR Day gifts had on campus. This year’s ROAR Day features a variety of challenges throughout the day, giving donors the opportunity to increase the impact of their gift. For more information about RIT’s giving day, go to the ROAR Day website or the ROAR Day FAQ page.